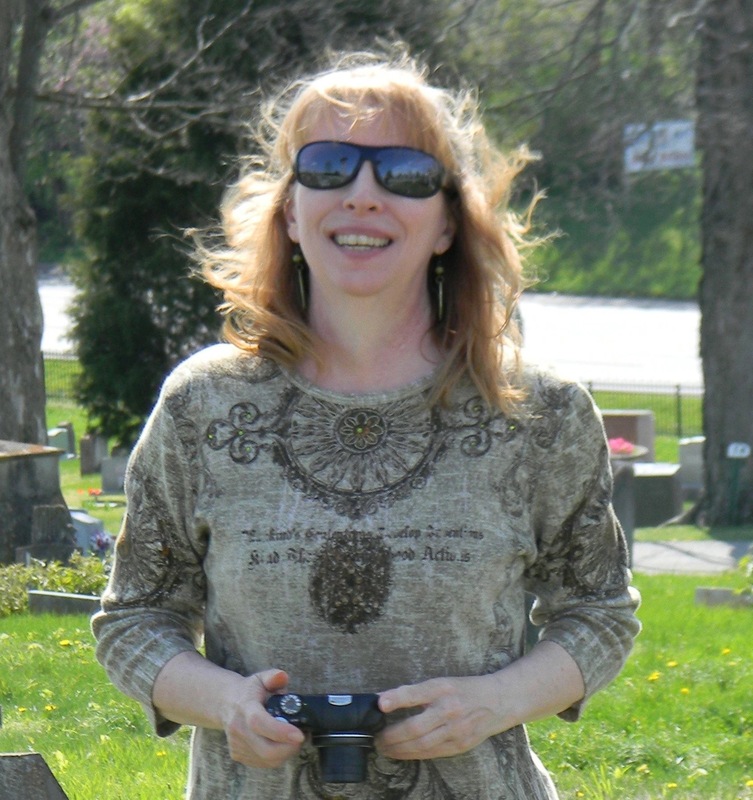 Joy Neighbors began blogging in 2011 about cemeteries, history, and genealogy at A Grave Interest. Currently, she’s exploring truly spooky cemeteries like the Indiana Insane Asylum’s, but she’s written about medical pioneers, Hollywood stars, and “Cemeteries Worth the Visit.” One of my favorite of her posts was an intensive look at the victims of Jack the Ripper and their final resting places. At the moment, Joy is raising funding for a book inspired by her cemetery explorations. I’m a backer. Hopefully, you’ll choose to become one, too. 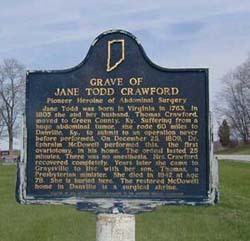 Cemetery Travel: What sparked your interest in Jane Todd Crawford’s story in the first place? Joy Neighbors: I discovered the grave of Jane Todd Crawford last year, when I was out researching for my cemetery blog, A Grave Interest. 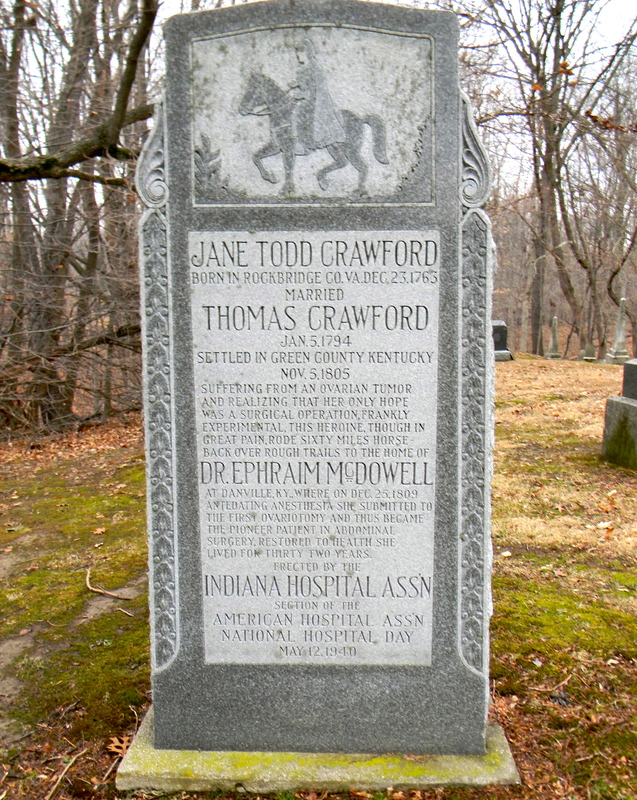 I stopped to take photos of stones, when I came across a historical marker describing Jane Todd Crawford as a medical pioneer; she is the reason that not only ovarian surgery but also any abdominal surgery became possible. I began researching her life, but was called to Kentucky for nine months of consulting work. During free time there, I went to several cemeteries, including the one in Danville, Kentucky. That’s where I discovered the home of Dr Ephraim McDowell, the doctor who had performed this lifesaving surgery on Jane Crawford over 200 years ago. All of the pieces just came together. How could I not write this book? The historic plaque at Jane’s grave. Photo by Joy Neighbors. Jane Todd Crawford had thought she was pregnant with twins, but consulted a doctor when the pregnancy went too long. Dr. Ephraim McDowell examined her and pronounced the pregnancy an ovarian tumor—a death sentence in 1809. McDowell thought he could operate, but he warned Jane that it had never been done successfully. Jane weighed her options and agreed to the experimental surgery. Dr. McDowell successfully removed the 22-pound tumor during a 25-minute operation. Jane was able to return home before the end of January 1810. She spent a few more years in Kentucky before moving to Indiana, where she lived for another 30 years. Cemetery Travel: Could you describe her tombstone? Jane Todd Crawford’s monument. Photo by Joy Neighbors. Joy Neighbors: Her original stone is rectangular and hard to read due to years of weathering. It had been broken off at the base and was placed in cement with a plaque at the foot of it in the 1940s when the large monument was erected. The monument has Jane’s story on the front with a carving of Jane on horseback. (No tumor is apparent in the carving.) The first time I saw it, I thought it was a knight on horseback. Cemetery Travel: What are you planning to do to get the word out about her courage? Joy Neighbors: I know I have everything to make this a success, except the finances. That’s when I started looking for an innovative way to finance the project. A friend told me about Kickstarter, a crowd-funding site. It just made sense. I come from a public broadcasting background, so I understand pledging. This is the same thing; I’m asking you to pledge a certain amount of money in return for a reward of an equivalent or higher value. Unlike PBS, if I don’t raise the specified amount by the end of my campaign period, I don’t receive any of the money and none of the backers are charged. My financial goal to do this book includes funds for research, travel, interviews, publishing, rewards, shipping, and taxes for a total of $30,000. So, it all comes down to arithmetic; 3 backers at $10,000 each, or 30 at $1,000 each, or 300 at $100 each, or 1,200 at $25 each will reach my goal. I only have about a week left to get the project fully funded. To learn more, view the video, or back the project, just go to http://www.kickstarter.com/projects/janetoddcrawford/jane-todd-crawford. I’ve taken it viral with Facebook and Twitter. I also have the Jane Todd Crawford page on Facebook. I’ve sent press releases out nationally and contacted hundreds of ovarian cancer groups, history groups, and women’s groups. Cemetery Travel: How can people help? Joy Neighbors: I’m asking everyone to check out the links above, pledge what you can, and please post these links on your social media platforms. Time is growing short!! To view the video and back the project, just go to Kickstarter. Cemetery Travel: What’s the philosophy behind your blog? Joy Neighbors: A Grave Interest is a blog about cemetery culture—art, history, issues of death, and genealogy—subjects of current relevance. People seem to view cemeteries as places you only go during a funeral, or to visit a loved one’s grave. I’ve always loved going out and exploring in cemeteries. You never know what you’ll find! Writing my blog makes it even more fun for me, because I can share my discoveries with other like-minded people. Cemetery Travel: How do you choose topics for it? Joy Neighbors: I usually find something that intrigues me, something that makes me want to dig deeper: something relevant, yet fascinating, that I can research. I’ll sit down in November and gather together all of the topic ideas I’ve had over the past year, then I’ll take a calendar for next year and begin assigning topics for certain dates. I publish every Friday, so I can decide where something will fit, based on the month and date. I like to keep it seasonal and historical. For instance, on the anniversary of Miles Davis’ death last month, I had a post about his life, closing with where he’s buried. Cemetery Travel: What do you call your love for cemeteries? Do you consider yourself a taphophile? Joy Neighbors: Oh yes! I am one of those people who love to wander cemeteries. I actually enjoy it more than visiting a museum. And I love being outdoors. Cemeteries are one of the most overlooked repositories of sculpture, stained glass, carvings, and architecture in the world. A cemetery gives you a unique opportunity to enjoy rarely appreciated art forms and designs and a chance to explore the history of that area—and its available for everyone to enjoy. Cemetery Travel: What’s your favorite cemetery in the world—and why? Joy Neighbors: It sounds cliché, but usually it’s the one I’m in at the moment. There’s so much that each one has to offer a Tombstone Tourist. You just have to take the time and explore, cause you never know what wonderful gem of art or history you’ll find. Cemetery Travel: What cemetery would you most like to visit that you haven’t yet? Joy Neighbors: WOW! I’d have a problem narrowing that list down to the top ten… 😉 I would love to go see the cemeteries of New Orleans; I’ve heard that they are amazing. But I’d also like to wander around Bonaventure Cemetery and take their Haunted Tour. Out of country, my first stop would be the cemeteries of Barcelona. The artwork and sculptures there are fantastic! Cemetery Travel: People who like cemeteries often feel isolated or strange. Do you have any advice for them? Joy Neighbors: I would suggest getting involved with your local cemetery and getting to know the people there. Check out your local genealogy and historical groups and societies. These are people who also care about the past, about preservation and history. Join some cemetery groups on Facebook. People in these groups love to discuss and share their experiences and photos regarding cemeteries. The main thing is to find where you connect, who are the groups and people who get the same vibe you do from cemeteries. As an aside, I will say that if a cemetery, an area of the cemetery, or a group of people, for that matter, feels uncomfortable, don’t stay. Always follow your intuition. That’s why it’s there. Cemetery Travel: What’s one thing people can do to ensure the survival of their favorite cemetery? Joy Neighbors: Offer to volunteer and be ready to do what they need. Most of us would love to be part of a restoration or preservation project, but if your cemetery needs help with filing, or deciphering old records, then do it. It shouldn’t matter how we help, just that we help. Joy Neighbors: Cemeteries symbolize our past, and our present. You can learn so much about a country, a community, or a group by the way they utilize their cemeteries, and the manner in which they are laid out, managed, and preserved. Cemeteries provide an excellent view back into history; the problems and diseases dealt with, the manner in which people lived and what was important to them. Cemeteries are truly an unvarnished look into the past. Joy Neighbors: There’s no right or wrong way to explore or enjoy a cemetery. Just go out there and let the past sweep you away for a while. This entry was posted in Cemetery interview and tagged A Grave Interest, cemetery blog, Joy Neighbors, kickstarter campaign. Bookmark the permalink. Very interesting story about Jane Crawford! I know! I had trouble getting through a cesarean with anesthesia. I hope Joy can raise her funding and get the word out.